Standard medical electron linear accelerators (linacs) with flattened photon beams (also called flattening filter photon beam) are in clinical use from past 6 decades for treatment of cancer employing both conventional (e.g. parallel opposed field, box technique) and advanced (intensity-modulated radiotherapy, IMRT; intensity-modulated arc therapy, IMAT; volumetric modulated arc therapy, VMAT, etc.) techniques. The purpose of using flattening filter is to convert the forward peaked MeV bremsstrahlung photon intensity into uniform intensity pattern for obtaining clinically acceptable beam profile. However, recently introduced advanced techniques of radiotherapy are based on the further modulation in the intensity pattern of the flattened photon beam indicating that flattening of initially produced unflat beam is not necessary for such advanced treatment techniques. ,, A number of studies were carried out on existing medical linac by removing the flattening filter (FF) to produce the unflat photon beam and demonstrated their feasibility in the implementation of advanced radiotherapy techniques. ,,,,,,,,,, It was also demonstrated that the removal of the FF results in significant increase in dose rate by a factor of about 2-4, softening of the x-ray spectra leading to reduction in scattered radiation as well as reduction in neutron and photon leakage from the treatment head. ,,,,,,,,,,, Encouraged with such findings, manufacturers came forward with a modified version of linac designs incorporating the options of generating both flattened and unflattened photon beam for clinical use. This development has necessitated the modification in the evaluation criteria of the medical linacs before their clinical use. It is well known that the FF in a standard linac acts as an attenuator, beam hardener, and the scatterer. Due to removal of the FF, the dosimetric parameters such as field size definition, beam quality, surface dose, off axis ratio (OAR), beam flatness, symmetry, and penumbra as well as depth dose profiles of unflattened beam differs from flattened beam. Fogliata et al. proposed new definitions for evaluating the beam characteristics of FFF photon beams generated by standard medical linacs for establishment of quality assurance (QA) programs in the clinical environment by modifying the definitions of dosimetry quality control parameters of FF beams. However, evaluating the dosimetry characteristics of FFF photon beam applying their definitions are complex in nature, which requires normalization/re-normalization of beam profiles and finding out the inflexion points by taking derivatives of the beam profiles. Evaluation of dosimetry characteristics of FFF beam as per their definitions requires the use of dedicated software and hence need further review and simplification so that the user can easily implement in the practice. As of now, no standard acceptance test protocol containing easily implementable definitions of dosimetry parameters is available for unflat photon beam generated by standard medical linacs. The Atomic Energy Regulatory Board (AERB) of India constituted a Task Group (TG) comprising experts from regulatory agency, advisory body/research and technical institutions, and clinical radiotherapy centers in the country to evolve and recommend the acceptance criteria for the flattening filter-free (FFF) photon beams. The Task Group approached manufacturers/suppliers of standard medical linac for obtaining technical details about the technology of their FFF beam linac and their viewpoints in evaluating the characteristics of FFF photon beams. The information received from the manufacturers/suppliers as well as the data available in the literature were thoroughly reviewed and acceptance criteria for FFF photon beam from standard medical linac were evolved. One could think of using the available definitions of beam parameters prescribed for flat photon beams. However, some of the definitions of the beam parameters (e.g., flatness, symmetry, penumbra) prescribed for evaluating the characteristics of flat photon beams are not applicable to unflat photon beams because of significant differences in shape of their beam profiles. The rationale for prescribing the definitions of beam parameters was to make it applicable to the shape of beam profiles of unflat photon beams. This paper presents the evaluation criteria and recommendations of the AERB Task Group constituted for this purpose. Currently two vendors, namely M/s Varian Medical Systems, USA (TrueBeam System) and M/s Siemens Medical Solutions, Germany (PreScision package for upgrading their existing linac models of PRIMUS, ONCOR, and ARTISTE for generating unflat photon beams), are supplying electron medical linacs which are having capabilities of generating high-intensity unflat photon beams. TrueBeam system is a new linac of Varian Medical Systems, which is designed to deliver flattened (FF), as well as flattening filter-free (FFF) photon beams. It represents a new platform of Varian linacs, where many key elements including the waveguide system, carousel assembly, beam generation, and monitoring control system differ from the preceding CLINAC series. TrueBeam system of M/s Varian Medical Systems is supplied to the user in two different versions, namely TrueBeam and TrueBeam STx. TrueBeam is a general purpose linac while TrueBeam STx is a special purpose linac, which is used for stereotactic irradiations. These linacs are capable of producing stable, high-intensity beam output (high dose rate) over a wide X-ray energy spectrum. It also contains a multiport X-ray filter management system (carousel) that accommodates field flattening filters and open ports. The dosimetry systems of these linacs (i.e., monitor chamber) are capable of accurately processing a wide range of ionization per pulse. The maximum dose rates of TrueBeam system are 1400 and 2400 MU/min for 6 MV (labeled as 6XFFF) and 10 MV (labeled as 10XFFF) X-rays, respectively. M/s Siemens Medical Solutions introduced a new option called PreScision package for upgrading their existing linac models of PRIMUS, ONCOR, and ARTISTE for generating unflat photon beams. The PreScision feature supports stereotactic radiosurgery (SRS) as well as stereotactic radiotherapy (SRT) using the conventional linac and subsystems for the delivery of precision dose to tumors using high-intensity unflat photon beams. The PreScision option can be used for operating the linac up to the dose rate of 2000 MU/min for nominal unflat photon beam energy of 7 MV (labeled as 7UF). The quality index of unflattened 7UF photon beam is similar to quality index of 6 MV flattened photon beam. Nominal beam energy along with measured TPR20/10 values for 10 cm × 10 cm collimator setting shall be recorded for all available unflattened photon beam energies. Surface dose shall be measured for collimator settings of 10 cm × 10 cm and 20 cm × 20 cm and compared with the corresponding nominal flattened photon beam energy. For medical electron linear accelerators capable of producing unflattened photon beam with field size less than 10 cm × 10 cm, the dosimetric parameters such as field size, flatness, symmetry, and penumbra shall be measured and evaluated following the methods applied for flattened photon beams as recommended by International Electrotechnical Commission (IEC 60976, 2008). Accordingly, the flat region of a beam profile along major axes for field sizes less than 10 cm × 10 cm is defined by subtracting 1 cm from either side of the beam profile. For example, for a beam profile of field size 5 cm × 5 cm, the flat region is considered to be the central 3 cm of the beam profile. In case, the beam flatness for unflattened photon beams of field sizes less than 10 cm × 10 cm are greater than ± 3% tolerance (i.e., beyond the acceptable tolerance for flattened photon beam), the field size, flatness, symmetry, and penumbra for such field sizes shall be evaluated using criteria recommended for the unflattened photon beams. The off-axis ratio at ± 3 cm lateral distance from central axis at 10 cm depth for 10 cm × 10 cm collimator setting shall be measured and indicated for all the available unflattened photon beam energies. Depth dose profiles for 5 cm × 5 cm, 10 cm × 10 cm and 20 cm × 20 cm collimator setting shall be measured. The depth of maximum dose (dm) and percentage depth dose (PDD) at 10 cm depth shall be indicated for all the available unflattened photon beam energies. The field size(s) shall be defined by collimator settings only. For verifying the constancy of the beam profiles along major axes (cross-plane and in-plane), the separation between inflection points (IPs) shall be recorded. Inflection point shall be identified as per its mathematical definition. However, for practical purposes, it can be approximated as the mid-point on either side of the high gradient region (sharply descending part) of the beam profile. Its location can be identified as follows [Figure 1]: Locate starting point (S) and end point (E) of high gradient region of the beam profile. The vertical separation between S and E is the height (h) of the high gradient region of the beam profile. Inflection point is located at h/2 on the beam profile from either location (S or E). Symmetry shall be evaluated following the methods recommended for flattened photon beams by International Electrotechnical Commission (IEC 60976, 2008). 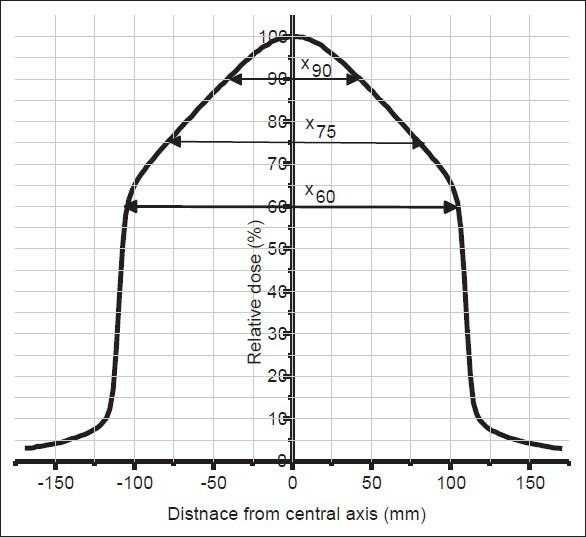 To quantify the degree of unflatness, the lateral distance from the central axis at 90%, 75% and 60% dose points on either side of the beam profile shall be recorded along major axes for all the available unflattened photon beam energies [Figure 2]. If we apply the definitions of flatness of flat photon beam for evaluating the flatness of unflat photon beams of field size greater than 10 cm × 10 cm, the flatness value may be 10-40%, which may be much higher than the recommended tolerance for this parameter. Accordingly, new definitions have been provided. For determining radiation beam penumbra, dose value at IP shall be taken as reference dose value (RDV). Points Pa and Pb, which are located at 1.6 and 0.4 times of RDV, respectively, shall be identified [Figure 1]. 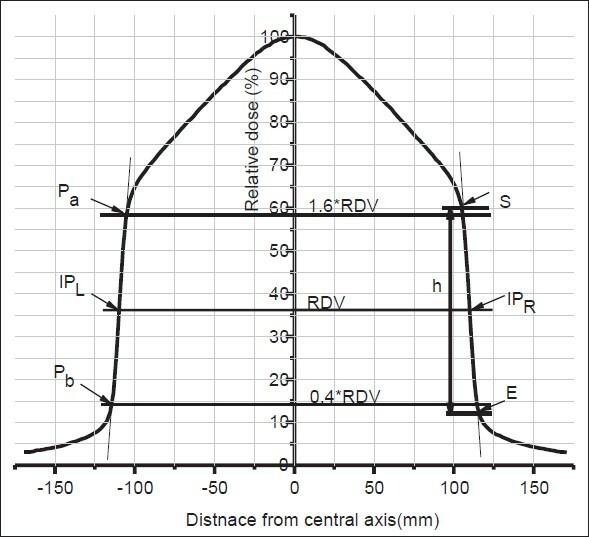 Lateral separation between Pa and Pb on either side of the profile will be the measure of the radiation beam penumbra. The penumbra along major axes shall be indicated for all the available unflattened photon beam energies. While measuring beam profile of unflat photon beam, the user should ensure that the dosimetric device/radiation field analyzer (RFA) system used for this purpose will work reliably in high dose rate operation (1000-3000 MU/min) of the linac. The Task Group recommended that periodic QA tests shall be carried out on daily/monthly basis and proper records should be maintained to verify the constancy in the performance of the linac in comparison to baseline data of the given parameter generated at the time of acceptance testing/clinical commissioning. Quality control dosimetry device such as 2D array can be used for generating the beam profile in this case. The beam profiles should be measured using multiple detector system/any other suitable device for 20 cm × 20 cm collimator setting. Recommended QA parameters were measured on three different models of the medical linear accelerators having capabilities of generating FFF photon beam in addition to FF photon beam. Beam profiles and depth dose curves of both FF and FFF photon beams were measured using 3D-RFA (Blue phantom, IBA, Sweden) using CC13 ionisation chamber (sensitive volume of 0.13 cc). The measurement accuracy was within 1%. The ionization chambers/dosimetry diodes used for flat photon beam dosimetry are also useful in unflat photon beam dosimetry. However, care should be taken about the current range of electrometers. Majority of vendors have come out with a communication that their existing dosimetry instruments are also suitable for dosimetry of unflat photon beams. The user should verify the suitability of the dosimetry system before measurements of the required beam parameters. The measured beam profiles were analyzed for evaluating the symmetry, degree of unflatness, radiation beam penumbra, and OARs applying the definitions recommended by the Task Group. The depth dose curves were analyzed for determining depth of dose maximum, percentage depth dose at 10 cm depth and the difference in percentage surface dose. The quality indices (TPR 20],[10 ) for 6 and 10 MV flat and unflat photon beams were measured using reference dosimetry phantom. The measured values are shown in [Table 1]. The data given in [Table 1] is determined from the measured profiles of unflat photon beams as the numerical values of the quoted parameters are more important than the beam profiles. The measured quality index for corresponding flat photon beam energy has been indicated in the parentheses. This exercise provided the confidence that the recommended dosimetry parameters can easily be measured and documented for characterizing the FFF photon beam. It is also expected that the user will use these definitions for generating the values of recommended dosimetry parameters on periodic basis to ascertain the constancy in the performance of the medical linac in the FFF mode of operation. 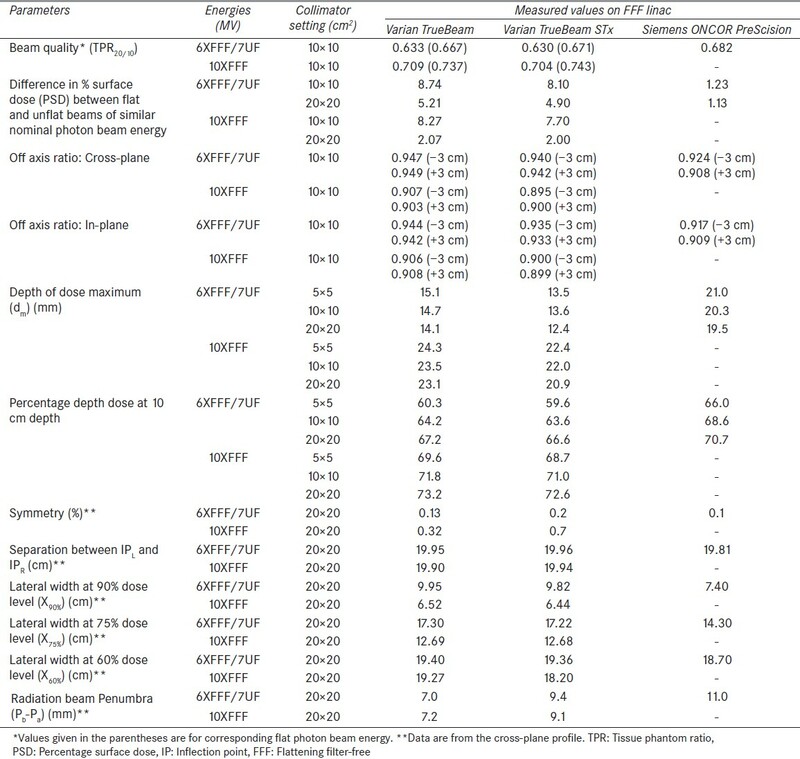 A format for recording the values of the parameters required for assessing the constancy in the characteristic parameters of FFF photon beam was also prescribed [Table 2]. Usually, the collimator setting for defining a nominal field size is calibrated with respect to lateral separation between 50% dose points on the beam profile of a flattened photon beam. However, in case of FFF beam, the separation between the IPs can be a measure of radiation field size for unflattened photon beams, which can be compared with the collimator setting used for generating the beam profile. The user should also record these data and verify the constancy of the beam size with respect to collimator setting. The AERB Task Group constituted to evolve and recommend the acceptance criteria for the FFF photon beams thoroughly reviewed the literature available and technical details provided by the manufactures/suppliers about the characteristics of unflat photon beams. Based on the review of available information and deliberations among the members and invitees, the Task Group prescribed the definitions of dosimetry parameters required for evaluating the characteristics of the FFF photon beams. Measurements were carried out on three different models of the medical linacs, capable of generating FFF photon beams for clinical applications, to evaluate the recommended dosimetry parameters and assess the simplicity in implementing the recommendations. This exercise provided the confidence that the recommended definitions and evaluation procedures are simple in nature, which can easily be implemented by the medical physicists in the hospitals. It is therefore expected that the recommended dosimetry parameters can easily be implemented during acceptance testing of the FFF photon beam with the existing infrastructure available at medical linac facility of the radiotherapy departments. The Task Group also prescribed parameters for periodic quality control check of the FFF photon beam, which will help in ascertaining the constancy in the performance of medical linacs in FFF mode of operation. The Task Group thankfully acknowledges the inputs of M/s Varian Medical Systems and M/s Siemens Medical Systems regarding the technology of their FFF beam linacs. Authorities and staffs of Health Care Global, Bangalore & Ahmadabad; Rajiv Gandhi Cancer Institute, New Delhi; Ruby Hall Clinic, Pune are acknowledged for extending their help and support in generating the data required for testing the recommended acceptance criteria. The Task Group expresses its gratitude to the Chairman, AERB; Head, RSD, AERB and Head, RPAD, BARC for the support rendered in completing the recommendations. The help and support of the officers of RSD, AERB are also thankfully acknowledged. Georg D, Knoos T, McClean B. Current status and future perspective of flattening filter free photon beams. Med Phys 2011;38:1280-93. Hrbacek J, Lang S, Klock S. Commissioning of photon beams of a flattening filter-free linear accelerator and the accuracy of beam modeling using an anisotropic analytical algorithm. Int J Radiat Oncol Biol Phys 2011;80:1228-37. Hrbacek J, Lang S, Graydon SN, Klock S, Riesterer O. Dosimetric comparison of flattened and unflattened beams for stereotactic ablative radiotherapy of stage I non-small cell lung cancer. Med Phys 2014;41:031709. Vassiliev ON, Titt U, Kry SF, Ponisch F, Gillin MT, Mohan R. Monte Carlo study of photon fields from a flattening filter-free clinical accelerator. Med Phys. 2006;33:820-7. Ponisch F, Titt U, Vassiliev ON, Kry SF, Mohan R. Properties of unflattened photon beams shaped by a multileaf collimator. Med Phys 2006;33:1738-46. Parsai EI, Pearson D, Kvale T. Consequences of removing the flattening filter from linacs in generating high dose rate photon beams for clinical applications: A Monte Carlo study verified by measurement. Nucl Instrum Methods Phys Res B 2007;261:755-9. Kragl G, af Wetterstedt S, Knausl B, Lind M, McCavana P, Knoos T, et al. Dosimetric characteristics of 6 and 10 MV unflattened photon beams. Radiother Oncol 2009;93:141-6. Dalaryd M, Kragl G, Ceberg C, Georg D, McClean B, Wetterstedt S, et al. A Monte Carlo study of a flattening filter-free linear accelerator verified with measurements. Phys Med Biol 2010;55:7333-44. Georg D, Kragl G, Wetterstedt S, McCavana P, McClean B, Knoos T. Photon beam quality variations of a flattening filter free linear accelerator. Med Phys 2010;37:49-53. Sawkey DL, Faddegon BA. Determination of electron energy, spectral width, and beam divergence at the exit window for clinical megavoltage x-ray beams. Med Phys 2009;36:698-707. Fogliata A, Garcia R, Knoos T, Nicolini G, Clivio A, Vanetti E, et al. Definition of parameters for quality assurance of flattening filter free (FFF) photon beams in radiation therapy. Med Phys 2012;39:6455-64.
International Electrotechnical Commission, "Part 2-1: Particular requirements for the safety of electron accelerators in the range 1 MeV to 50 MeV," Report no. IEC-60601-2-1 Geneva: IEC; 1998.
International Electrotechnical Commission, Medical electrical equipment - Medical electron accelerators - Functional performance characteristics, Report No. IEC-60976. Geneva: IEC; 2007. Central axis depth dose data for use in radiotherapy departments. British Journal of Radiology Supplement No. 25; 1996.